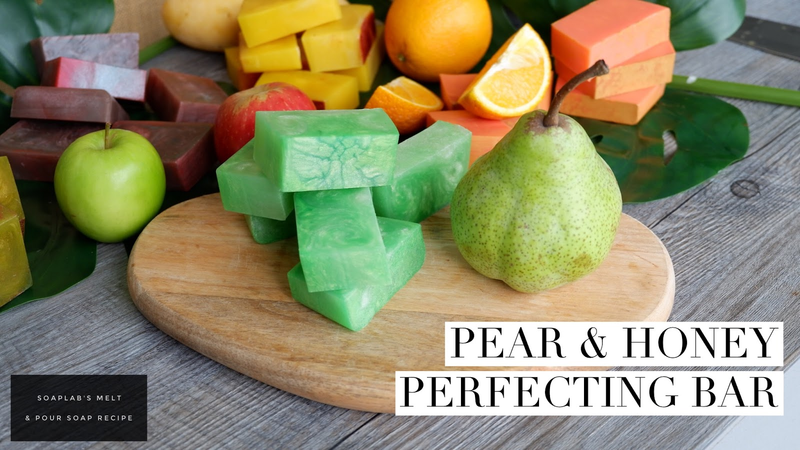 Today we will be making a beautiful pear and honey perfecting bar. For this, you will need a honey soap base which is rich in antioxidants and is great in repairing dry and damaged skin. Next add, the special ingredient which is fresh pear juice. By just adding this fresh ingredient, you are making a much better decision for your skin, in comparison with the chemical laced soap products you will find in the market. Fresh pear juice is full of vitamin C, giving your skin a radiant glow. It also helps the skin retain its natural moisture. Next add, melon jasmine fragrance oil giving it a fragrant flowery smell which is quite intoxicating. Finally, add jade green mica and sparkle silver, and there you have it, a beautiful soap which is great for your skin. P/S: in this recipe we are using fresh juice. as mentioned in this post here; when using fresh juices your shelf life of products will reduce dramatically. We have tested and done microbial test on few soaps and found that when you use at the measurement given (in the download recipe); the soap has a shelf life of 3 months.